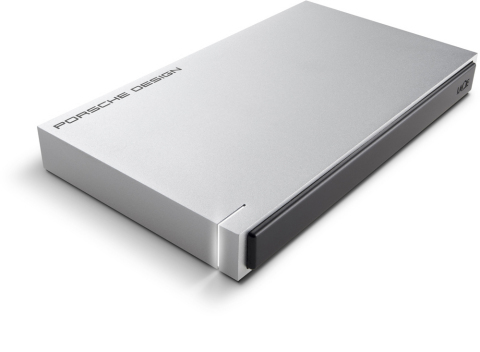 Today LaCie, the premium brand of Seagate Technology plc (NASDAQ: STX), announced the addition of USB-C technology to its Porsche Design Mobile Drive. This product combines the ease of use of USB-C with the proven speed, style and durability of the LaCie Porsche Design line, making it the perfect match for the latest MacBook®. The LaCie™ Mobile Drive features a USB-C port — the user-friendly connector of the future. This new technology makes the LaCie Mobile Drive incredibly easy to connect, since both ends of the cable are identical and the connector is reversible. As a result, there is no need to worry about which end goes to which device or about plugging it in upside down. The LaCie Mobile Drive blends form and function, resulting in a product that looks and works great. Its USB 3.0 interface delivers up to 100 MB/s*, which lets users quickly back up or exchange photos and videos with friends. The LaCie Mobile Drive also features an enclosure made from 3 mm-thick solid aluminum. This gives users the confidence to slip the product into their laptop bag and hit the road. The LaCie Mobile Drive was designed especially for Mac® users. It features the same stylish, sophisticated aluminum finish as the latest MacBook. Plus, it is Time Machine® compatible, so Mac users can use the LaCie Mobile Drive to seamlessly back up files using built-in software. Thanks to the included adapter cable, it is even compatible with standard USB 3.0 (Type-A) or USB 2.0 ports. Since 2003, LaCie and Porsche Design have worked closely to create products that are technically inspired to deliver flawless functionality in its purest form. Each company complements the other, with technical influence from LaCie and an exclusive design and luxury brand presented by Porsche Design. The LaCie Mobile Drive features a two-year limited warranty that includes comprehensive, complimentary web-based resources, expert in-house technical support, and worldwide repair and/or replacement coverage. It is possible to upgrade this service with warranty extensions and fast product replacement. Learn more at www.lacie.com/warranties. The new LaCie Mobile Drive will be available next quarter in 500 GB (slim size), 1 TB and 2 TB capacities through the LaCie Online Store and LaCie Resellers. Porsche Design is a luxury brand and was founded in 1972 by Professor Ferdinand Alexander Porsche. The products represent functional, timeless and purist design, and boast an impressive innovative standard. All of the brand's products are designed by the Porsche Design Studio and are sold around the world in more than 150 retail stores, high-end department stores, exclusive specialist stores and the official online shop (www.porsche-design.com). LaCie, the premium brand from Seagate Technology (NASDAQ: STX), designs world-class external storage products for Apple, Linux and PC users. LaCie differentiates itself with sleek design and unmatched technical performance. Learn more at www.lacie.com. © 2015 Seagate Technology LLC. All rights reserved. LaCie and the LaCie logo are trademarks or registered trademarks of Seagate Technology LLC or of its affiliated companies. Other trademarks or registered trademarks are the property of their respective owners. When referring to hard drive capacity, one terabyte, or TB, equals one thousand billion bytes. Your computer’s operating system may use a different standard of measurement and report a lower capacity. In addition, some of the listed capacity is used for formatting and other functions and will not be available for data storage. Seagate reserves the right to change, without notice, product offerings or specifications.